Kenneth Glen Knoll (72) was born May 14, 1946, in New Auburn, Wisconsin, to his parents, Irvin and Naomi Knoll. He died November 29, 2018, in Springfield, Oregon, surrounded by family. Ken graduated from Midwest Bible College in Stanberry, Missouri, with a degree in pastoral ministry. He married Mary Jean Wilson on June 15, 1969, in Conroe, Texas. He cherished Mary Jean and frequently bragged that he married up when he married her. Ken and Mary Jean have two daughters, Carla and Kristen (Kristi). During his almost 50 years of ministry, Ken pastored churches in Texas, Oklahoma, and Oregon. He retired from the Eugene Church of God (Seventh Day) in January 2014. However, he continued to be actively involved in the Church both locally and nationally, as well as with the Eugene One Hope Network of pastors and churches. Ken was known by many names, but his favorite was Papa. 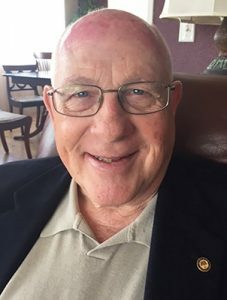 During his retirement years, he loved attending his grandchildren’s many sporting and educational events and volunteering in his daughter’s first grade classroom, where they affectionately called him Mr. Ken. Ken was passionate about his family, his friends, and his God. He will be remembered for his humor, his smile, his love of life, his unconditional love for others, and his total commitment to sharing the love of Jesus. During his brief illness, Ken was often seen with his hands lifted high, singing praises to God and His Son Jesus. Ken is survived by his wife, Mary Jean; daughters Carla McKibben (Jeff) and Kristen Lang (Kurt); sister Carol Joles (Henry); brother Paul (Valeta); five grandchildren; and many other relatives and brothers/sisters in Christ. He is preceded in death by his parents, sister Violet (Anklam), brother Jesse, and granddaughter, Amy Lang. In lieu of flowers, a memorial donation may be made to Artios Christian College at https://my.artioscollege.org/en/give or by check sent to Artios at the General Conference, P.O. Box 33677, Denver, CO 80233.